This hearty soup makes a delicious meal. When I first made it, I had fresh garlic scapes available, which was really tasty. Unfortunately, garlic scapes are only available about one month out of the year, so I’ve adapted the recipe for use with any garlic. If at all possible, use fresh, in-season garlic that hasn’t yet been cured. I have also made the recipe gluten-free by using masa harina (corn flour used to make corn tortillas). I find masa harina has a very clean flavor that is similar to wheat flour. Some other gluten-free flours add off flavors to soups and stews, but the masa harina does not. You can substitute any other gluten-free flour if you wish, or add all-purpose flour if you don’t have any problems with gluten. 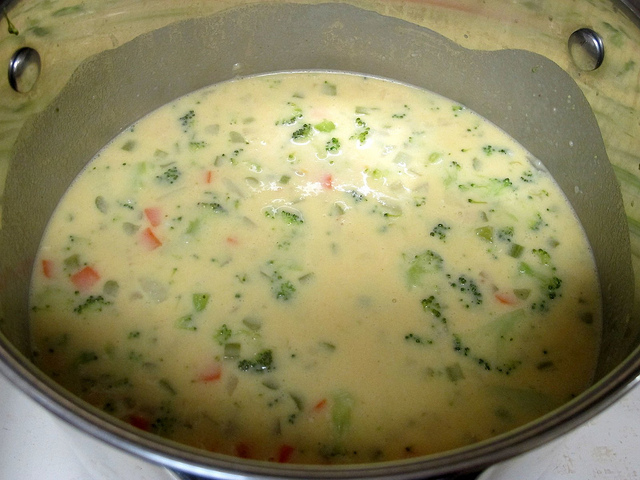 To make the soup dairy-free, as well, use your favorite non-dairy milk in place of the heavy cream and either use clarified butter or a clean-tasting oil that works well at high-temperatures, such as grape seed oil. In a large pot, heat butter on medium-high until it bubbles. Add the sausage and cook, crumbling as you cook, until it browns. Remove the cooked sausage from the pot with a slotted spoon and set it aside on a platter. Add the onion and carrots to the fat that remains in the pan. Cook, stirring occasionally, until the vegetables begin to brown, about six minutes. Add the kale and cook, stirring frequently, until it softens, about three more minutes. Add the masa harina and cook, stirring constantly, for two minutes. Add the chicken stock. Use the side of the spoon to scrape any browned bits from the bottom of the pot as you add the stock. Add the red pepper blames, onion powder, garlic powder, beans, and potatoes. Return the sausage to the soup, adding the juices that have collected on the platter, as well. Bring the pot to a simmer and reduce heat to medium-low. Simmer the soup until the potatoes soften, about 10 minutes. Stir in the cream. Season to taste with salt and pepper.